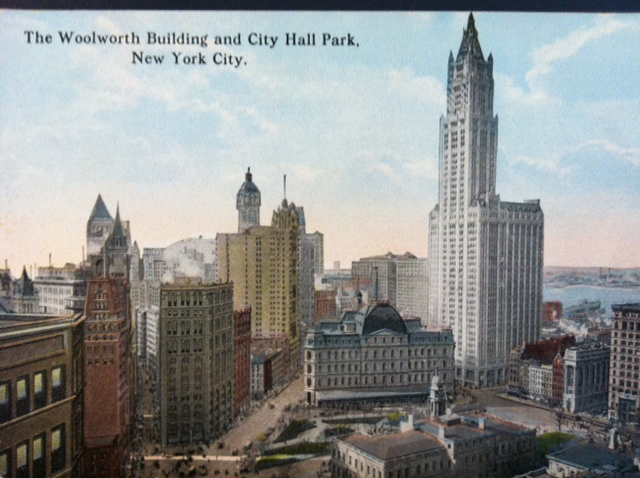 Woolworth Building: The Making of a New York Landmark from Center for Architecture on Vimeo. This event, co-sponsored by The Woolworth Centennial Celebration Committee, the AIA New York Chapter Historic Buildings Committe, and The Skyscraper Museum, was held at the Center for Architecture, 536 LaGuardia Place, New York. When the Woolworth Building was completed in 1913, critics hailed Cass Gilbert’s design as a spectacular feat of engineering and wondrous Gothic tower. The highest skyscraper in the world, it secured the emblematic status of New York’s skyline as a “city of towers.” But the Woolworth Building’s fame as a landmark belies the differing aims of its architect, client, and builder, each of whom had a unique relationship to the city. How did Gilbert reconcile his vision for the Woolworth Building with that of his client, F. W. Woolworth, and builder, Louis Horowitz of the Thompson-Starrett Company, to create the artistic masterwork and exemplar of urbanity that we recognize today? Gail Fenske is author of The Skyscraper and the City: The Woolworth Building and the Making of Modern New York (University of Chicago Press, 2008). She is professor of architecture in the School of Architecture, Art & Historic Preservation at Roger Williams University, and has taught as a visiting professor at Cornell, Wellesley, and MIT. She is also a licensed architect and has practiced architecture in Boston and New York. She holds a Ph.D. in the history, theory, and criticism of architecture from MIT.